Kaminario has taken the SPC-2 streaming storage benchmark, shook it hard, wrung it out, and left everyone else for dust with its K2 all-flash array, with a result nearly twice as fast as the previously top-ranked Oracle ZFS array. The SPC-2 benchmark tests a storage array's streaming IO performance whereas the companion SPC-1 benchmark tests random IO performance. 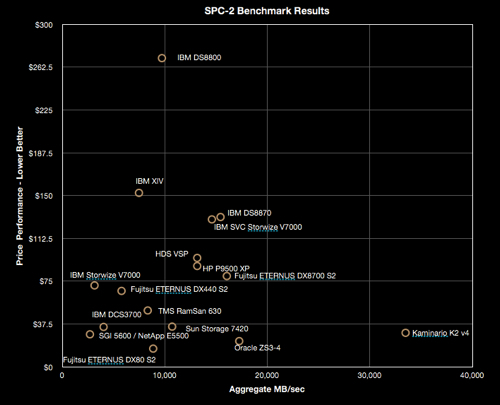 Kaminario's K2 v4 array beat everyone else on that benchmark recently. It used the same configuration device, with SanDisk SSDs, on the SPC-2 test and scored 33.477.03 MB/sec with a price/performance of $29.79/SPC-2 MB/sec.